For nearly two days now the many email folders in my universe have remained quiet. It’s called “propagation” in the jargon of internet specialists. I call it “bliss.” I’ve forgotten what it’s like to be off the grid. 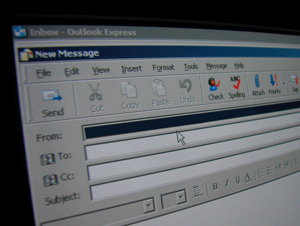 A long, long time ago (in what seems like a far distant galaxy), I shunned email. Does this surprise you? It should and it shouldn’t. I’ve always told people I was either born fifty years too early or fifty years too late. The former is revealed in my affinity for such things as classic trains, old time Americana, and the Marx Brothers. The latter manifests itself through my enthusiasm for astronomy and space exploration, the social possibilities of crowd-based technology solutions, and the new media. Truth be told, for all the technology edges I’ve found leading, I’m really a stubborn old coot. Yes, it’s true that in 1989 we were able to start a weekly community newspaper in no time because we utilized the strange new world of “Pagemaker” and “laser printers.” But, do you realize, I had still avoided all use of ATMs? I had no problem digitizing print media. I abhorred the thought of ceding my preciously small bank account to some soulless machine. Nope. Give me a flesh and blood teller any day. That was then. Modern times being what they are (and that includes fewer and fewer conveniently available bank branches), I now joyfully engage in the fingerplay of the ATM. For withdrawals. I still refuse to place deposits in them. My trust for machines may never break through that threshold. Instead, I religiously use those archaic pneumatic tubes. Talk about Neanderthal. The same held true for email. I was one of the first people to use the internet for business. Remember Prodigy? Well, the story begins before that. By the mid-1980s, I was running a robust management information system that required electronic connections to various aspects of the financial industry – from settling trades to pricing securities. This was before the internet. Everything had to be dial-up through a modem. (I can still hear the quirky electronic tones from my Hayes modem followed by the “rrrusshhh” indicated the connection had been established.) I had access to message boards (called “BBS’s” or “Bulletin Board Systems”) but I had no interest in them. I was strictly business. Then along came Prodigy. It wasn’t a true ISP, but it was a taste of things to come. It, along with AOL (remember all those free disks they used to flood your mailbox with? ), competed for the attention of computer geeks (like me) across the nation. I convinced my employer I needed Prodigy. Admittedly, “need” was a bit of a stretch initially, but it turned out to be more than true as I learned how to use the system. I was able to finagle real-time access to critical information needed by our analysts and operations staff – for a much less costly price than using the then standard electronic communications products (think “Compuserve” for those old enough to remember). There was one novel idea, however, whose room I refused to enter. For the longest time, I stayed away from email. If you remember the origins of email – at least as far as Prodigy was concerned – it was to enhance the on-line shopping experience. I got enough junk mail in my physical mail box. I didn’t want to create a virtual mail box just to get virtual junk mail. Yes, the Neanderthal never left. I held out for as long as I could. But, just like with the cell phone I begrudgingly finally obtained, I learned, if I wanted to do business in the modern world, I needed an email. So I got one, but used it sparingly. It was through a company called Servetech and my email was ccarosa@servetech.com. That worked fine. Until Servetech went belly up. Not only did Servetech disappear, but so did my email. I was not impressed. Being the cheap – er – value-oriented kinda guy I am, I initially used a shared server. A shared server means you’re sharing the same server with everybody and his brother. Older folks might liken it to a telephone party-line. This has certain advantages (mainly low cost) but certain limits (including, speed, how much data you can store, as well as the usual security issues). Many of my sites can get away with being hosted on a shared server. A few of them (the publishing sites FiduciaryNews.com and MHFLSentinel.com) can no longer live in the limited world of shared servers. So, last week, at substantial expense I really didn’t budget for, I initiated the process to move the entire kit-and-caboodle to a dedicated server. That means there’s no one else on the line except the domain names under the umbrella of Pandamensional Solutions, Inc. – the company that owns The Sentinel (and a few other internet properties). To effect this transfer required me to do some things in the background so the World Wide Web would know the new IP addresses of all the sites. When you do this (you have to do the same thing every time you buy a new domain name and then shift it to a hosting site), it takes 24 to 48 hours for the internet to flush out the old pointers and fully replace them with the new ones. That’s what caused my emails to temporarily go silent. Except for one email – the one email I used to replace my original Servetech email. That’s why it’s always important to have at least one email at big providers like Yahoo, gMail, Earthlink, or, yes, AOL. I’ve got about a half dozen listed at those locations. I don’t use them regularly, but I’ve registered them there so no one else uses the names I want to use. But that was a subject addressed in an earlier Commentary “How to Prevent Real Identity Theft: Claim Your Name,” (Mendon-Honeoye Falls-Lima Sentinel, July 14, 2016). So, how do I feel now that I’m not badgered by incessant emails? A bit free. A bit lonely. And with a bit more time on my hands to write this and a few other pieces.